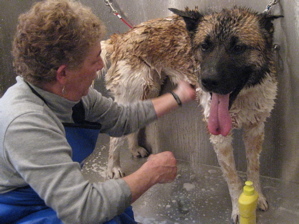 as much as you do"
If you don’t have the time or the tub to bathe your own dog we can do it for you. Baths are available to boarding and non-boarding clients. Grooming for long and short coated dogs includes bathing, brushing, cleaning ears, and cutting nails. We do not trim dogs or cats at this time. Use the pricing below as a guide to grooming costs for your dog. Copyright 2006 Dean of Dogs, Inc.